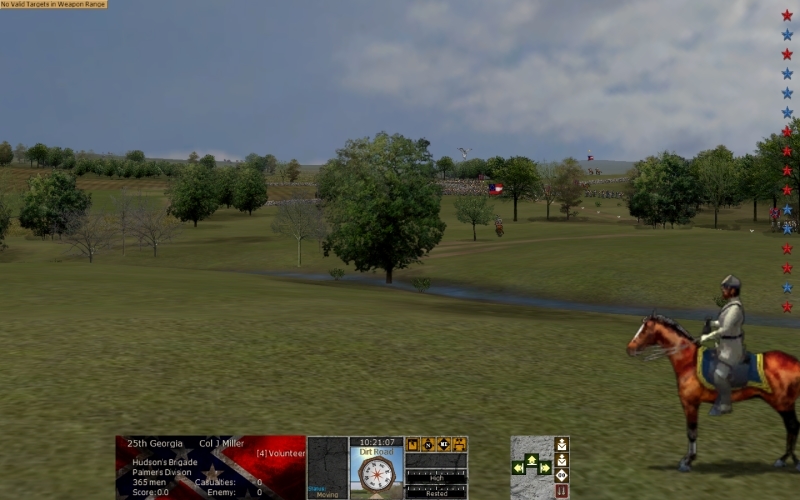 The recent skirmish at the outskirts of Richmond, Kentucky decided nothing. The armies, awaiting reinforcements and actively recruiting areas under their control, are back at it after a short rest. The collision for control of central Kentucky is upon the nation and will, by all appearances, be monumental! This game will be a fresh start from the HG7 encounter that froze mid-game. There will be a new map, new placements, new player rosters & reshuffled OOB’s, and CinC’s may make all new choices. Didn't make it to HG7? No problem! Everyone is welcome in this one. 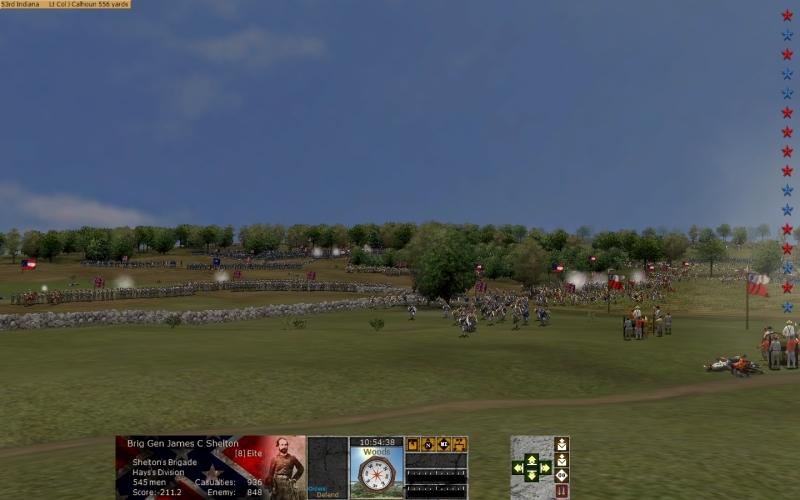 In the HITS/GCM game series the goal is to simulate the challenges of Civil War division command (or brigade command) by combining traditional HITS play with the enhancements and unique maps of Garnier’s Campaign Mod system. Adding to the command challenge are real-world limitations that place significant responsibility for executing players’ orders in the hands of the AI’s computer-controlled subordinates – who bring varying degrees of ability! (see “Restrictions on TC’ing brigades and regiments” below). To further enhance the player experience, participants are asked to be aware of their own position in the game’s OOB, and act accordingly when responding to “orders,” requests and other communication from the Army CinC, corps commanders, and teammates. 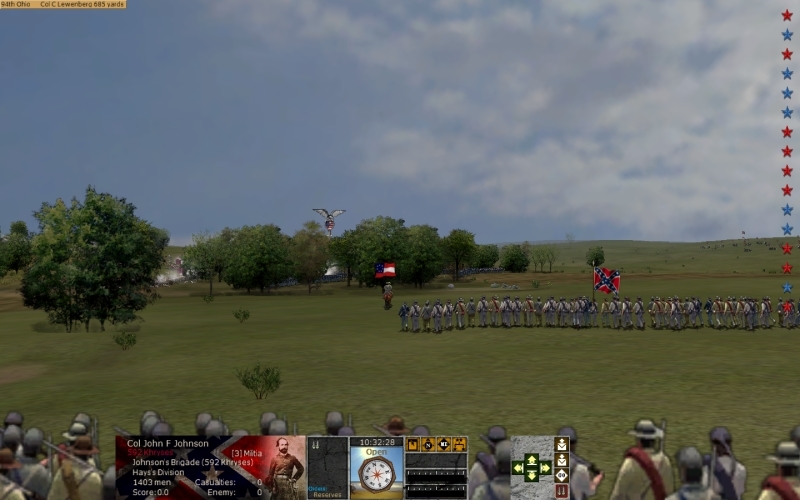 The in-game chain of command is set up to add realism, direction, and cohesion. Don’t be afraid to have fun role-playing with it! What’s new in this Game? 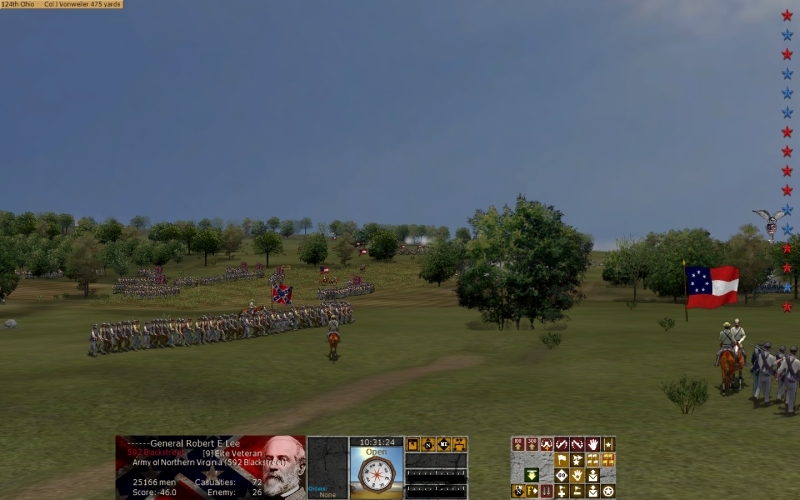 We will continue to offer players several command options including infantry divisions, independent infantry brigades, and large artillery commands. Army CinC’s may explore additional options for organizing their OOB’s. For instance, a CinC may choose to retain a small reserve under his control or assign a few guns to individual divisions as tactical support. Yankees and Rebels may bring different organizational styles and structures to battle. Players will lead moderately-sized units suited to their experience and preference and those who enjoy running the guns are likely to find themselves commanding the army’s artillery pool. In future games we expect to explore options to build in additional asymmetries in infantry numbers, guns, OOB structure, victory conditions, etc. to add variety and interest. To that end, please feel free to post your ideas on specific scenarios for the HG format. *In this game we continue our simplified restrictions on TC’ing and unit control. 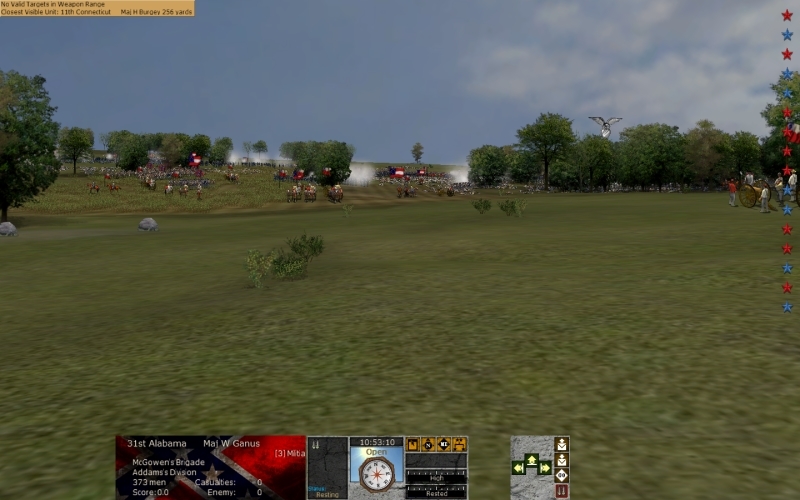 Players may take direct control of any or all regiments or brigade leaders within 50 yards. 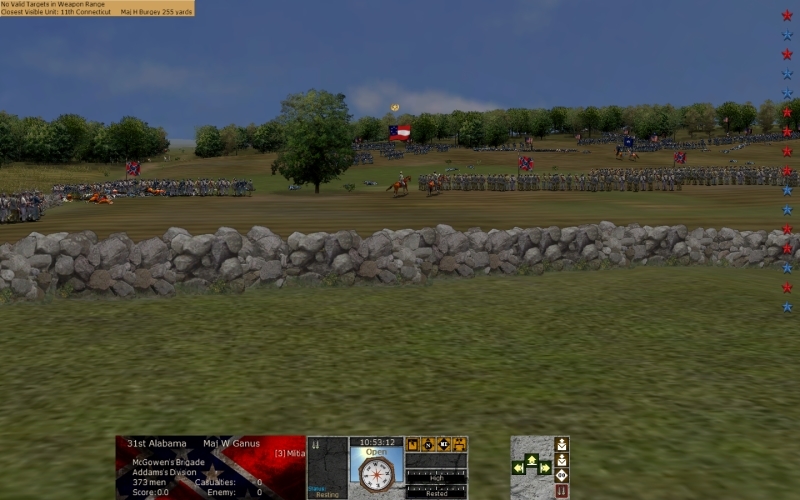 Once a player moves beyond 50 yards from a regiment or brigade leader, these must be returned to AI control. Exceptions: Army CinC’s personally commanding a reserve division, and players controlling batteries may freely TC (take and maintain control of) these units. *All players must register on GCM ahead of time http://www.sowmp.com/gcm and run the GCM launcher the day of the game. Plan on joining GCM Teamspeak 15 minutes before game time. 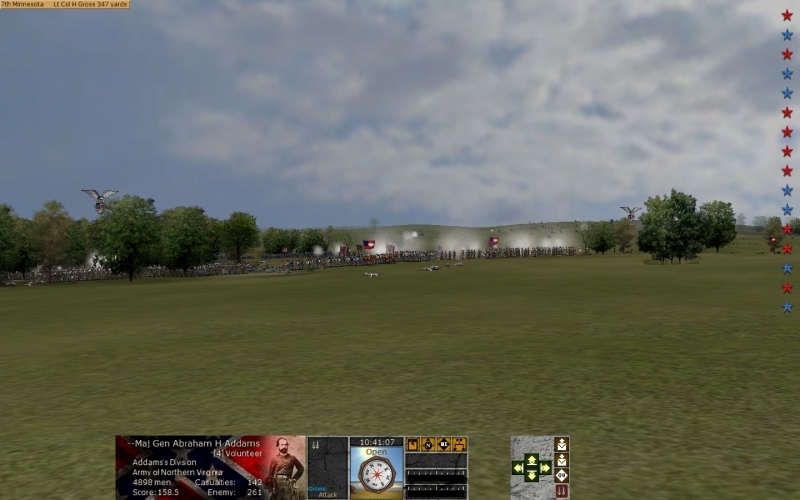 e) Players at brigade-command level are subject to the same TC’ing limitations as divisions i.e., a brigade commander may only TC regiments within 50 yards and must return regiments to AI control once beyond 50 yards. A map of the battlefield at Richmond, KY where HG8 will be fought may be downloaded here. Yanks won a stunning victory and have slammed the door on the Rebel invasion of Kentucky. In-Battle casualties were 8,873 for the Rebs and 6,436 for the Yanks. A brutal fight with 20 players. Well done, everyone! Report of the action in Kentucky, 23rd February 1863. Generals, I submit my report of the action in Kentucky that took place last night. 10:54 AM: The fighting on the left continues. Where is BoldRover's division? 10:54 AM: There! Using my field binoculars I see BoldRover's division finally emerging through the treeline. But I fear it is far too late, and the enemy seems able to turn and repel him. 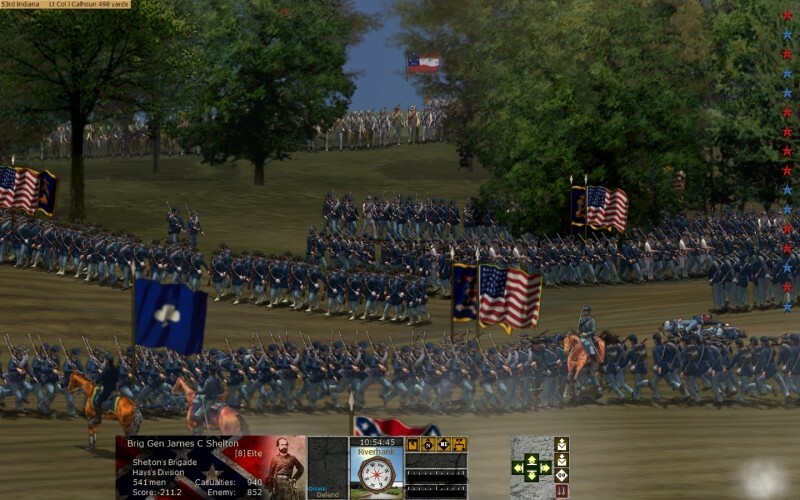 Nevertheless, the Confederates have lost too many men, we stand little chance of taking the 2 Northern victory locations, and Blackstreet orders a general withdrawal. It is with great pleasure I report the defeat of the enemy near Richmond this morning. The battle commenced when General Soldier who was leading his men southwest spotted what appeared to be a lone enemy division about a mile north of the Hodges farm. After quickly conferring with him, it was decided not to wait for the rest of the army to move up but instead quickly seize the nearby woods. 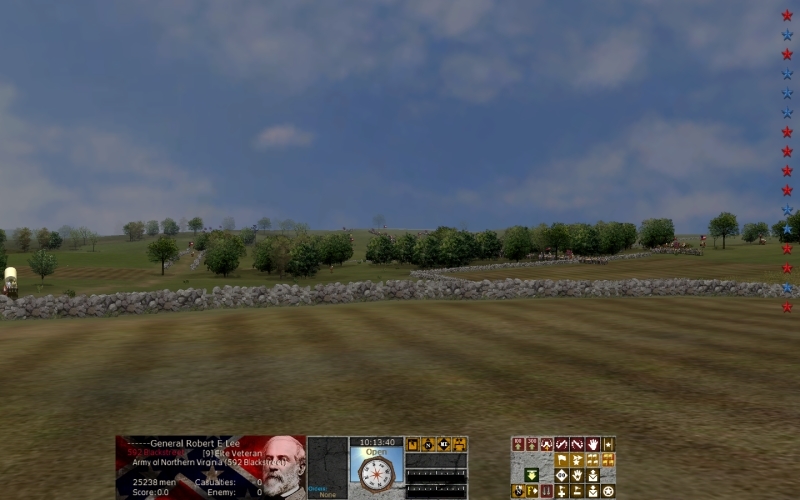 As this was taking place, another enemy division appeared near the Hodges farm. But it stayed in place and made no attempt to join with the division farther north. Also at this time, I noticed that General Shaka's division was moving into position from the northwest. As this was an opportunity to defeat the enemy in detail, I ordered both Soldier and Shaka to dispatch the lone enemy division. Both of our divisions deployed smartly and were soon in action. More enemy began appearing to the west. General Spoom's division came onto the field at this time and quickly moved to Gen. Shaka's right. Our plan was to envelop the enemy left. Gen Mitra was making a long march west, out of sight of the enemy and would fall on the enemy's rear. Just as his men were getting into position near the McGill farm, an errant shell exploded nearby and concussed the poor man. He was last seen galloping north shouting, "ciao, ciao!" I quickly rode north to the leaderless division and appointed Gen. Abby as commander. He sorted his men out and quickly moved to the right of Gen. Spoom's division and began implementing our goal of envelopment. 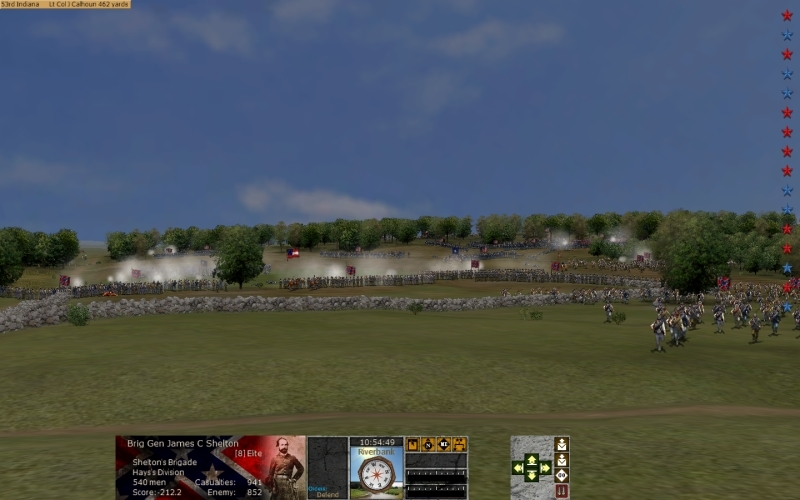 As Gen. Abby was moving into postion, the enemy moved a division up on his right with the intention of doing some mischief to our guns which were beautifully sited on high ground to the east of the battlefield. Little did he know that this division had moved into the very position where our final hammer stroke was to fall. General Byrd and his men slammed into the flank of this enemy force. The enemy was in danger of falling into a double envelopment. Had the enemy commander on this wing been slower to react, we would have had the opportunity to bag the entire rebel force. But he quickly repositioned his men and prevented Gen Byrd from accomplishing this feat. I was about to leave Gen. Abby to his work when I saw that the combined forces of generals Shaka, Spoom and Soldier had forced a collapse of the rebel center. I began to quickly ride to Gen George and his reserve division to order it to the left of Gen. Byrd and break the last enemy resistance. 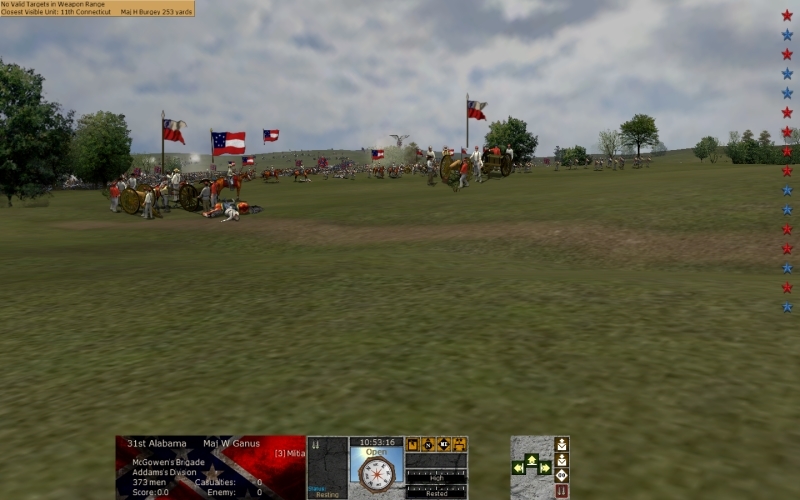 But before I could reach Gen. George, the enemy began to pull back yielding the field to us. Our casualties were quite heavy. Initial reports put them at 6,000 killed, wounded and missing. From the appearance of the battlefield, the enemy sustained far higher losses. After the battle, Gen Abby brought me some very disturbing news. His men came upon Gen. Blackstreet's personal baggage train. While securing the wagons, they found a large cache of silverware and other valuables. It appears that the general and his men had been looting the civilian population while moving towards Richmond. Such behavior is beneath contempt. I have secured the valuables and sent them north for safekeeping. I shall make every attempt to return these items to their rightful owners once this rebellion is put down. "He was last seen galloping north shouting, "ciao, ciao!'" Well in reality I told "ma p...a p.....a lurida,va a f......o connessione di m...a" but better you never know what is under the "." . Fantastic game fellas. Thanks to Ron again and well done Yanks. Nice pics Blackstreet. Now, a Movie from the commanders view would be cool.